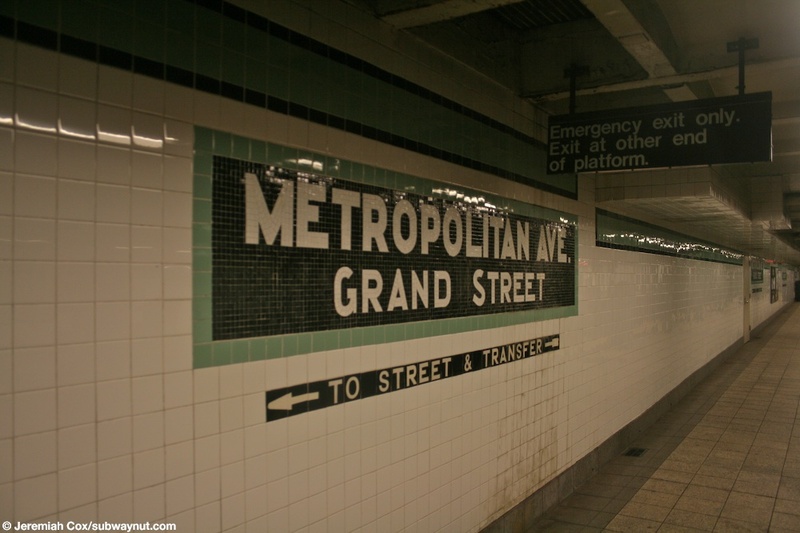 Metropolitan Av-Grand St is the only G train station to be fully renovated. 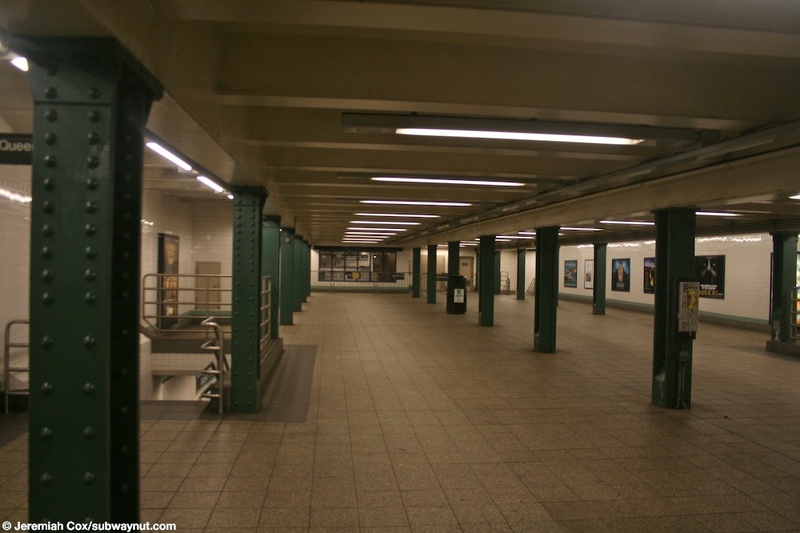 The station has a mezzanine that takes up about half the platform; the rest of it is now home to a NYPD Transit Police Station. 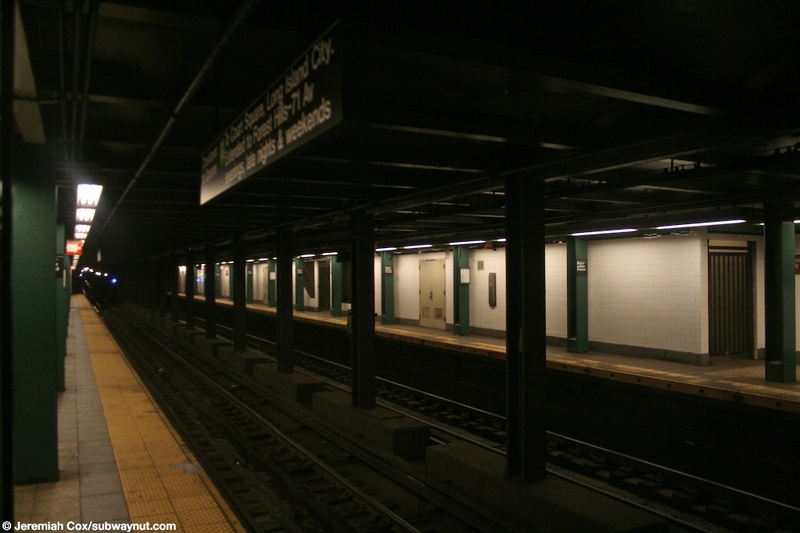 The station's side platforms have been rebuilt in such a way that only 6 R46 cars can platform. The southern end of each platform (for the last two cars of an eight car R46 train) is extremely narrow. There is just room for columns and the tactile warning strip, as well as some emergency staircase exits, and signs saying Emergency Exit only before the platform gets narrow. 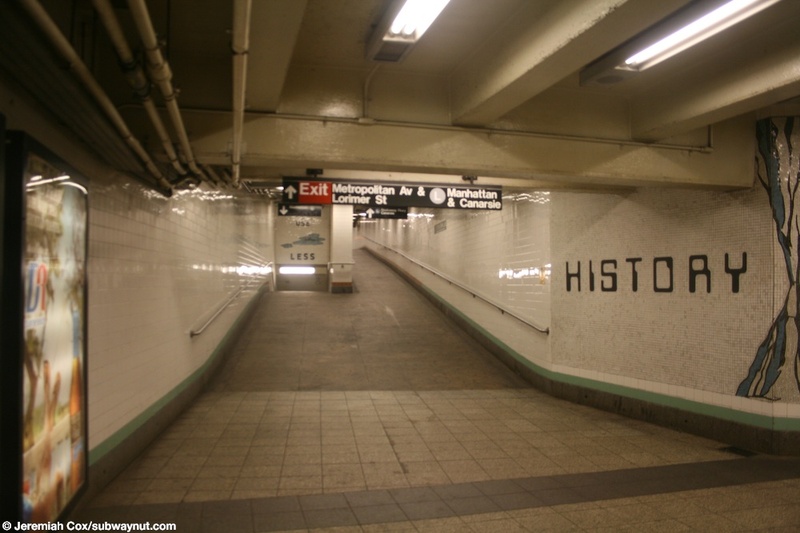 There is a full time exit off of the mezzanine as well as a HEET only one before the narrow passageway to the L train at the northern end of the station. 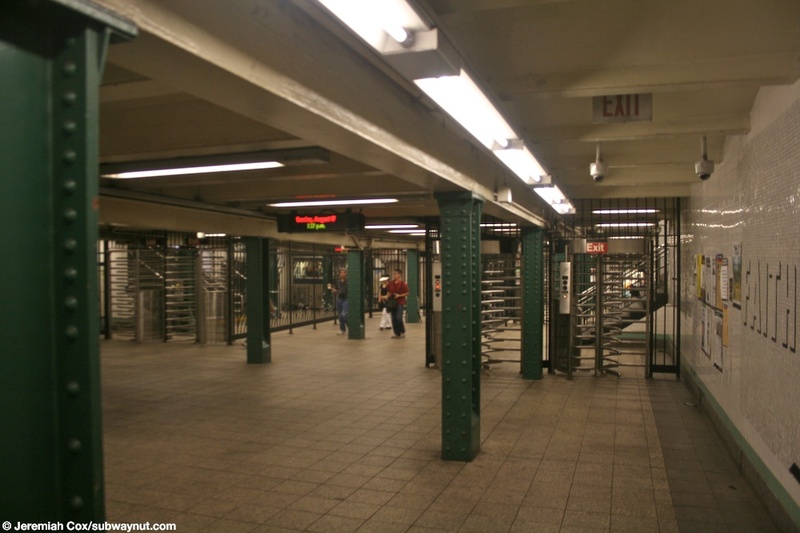 Access to the Canarsie-bound L platform is a simply a ramp, the Manhattan-bound one a staircase down and then up because of an underpass. 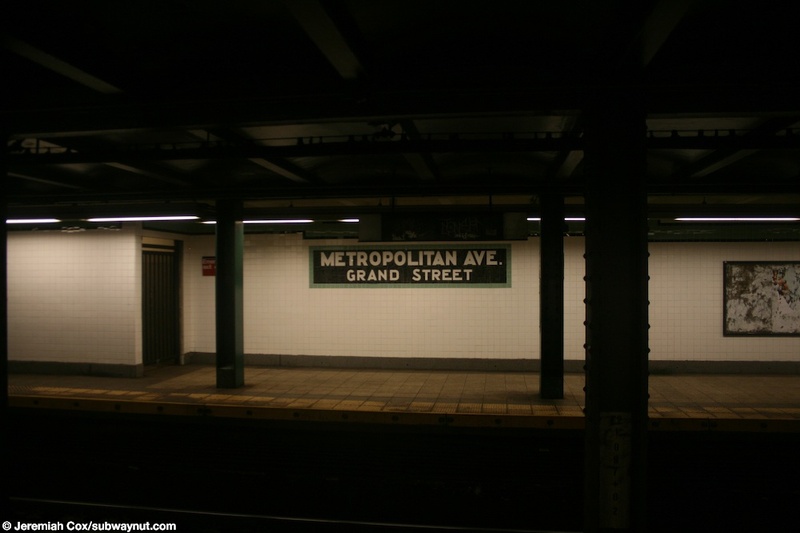 The station platforms themselves have quite low ceilings, green trim with no station tiling below it and green name tablets that say Metropolitan Avenue-Grand Street. Some of these have tiling below them that say 'To Street & Transfer'. 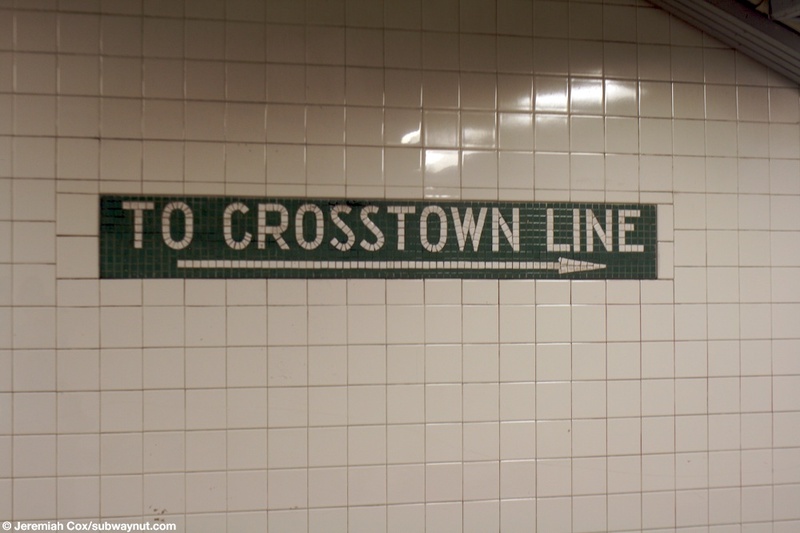 (metropolitang1) A view of two exits from the G-train mezzanine at Metropolitan Avenue as passengers transfer between the G and the L.
14 February, 2006 (metropolitang2) A mosaic sign 'To Crosstown Line' along the transfer corridor. 17 August, 2008 (metropolitang3) A view of the narrow corridor off the mezzanine at Metropolitan Ave that leads to the L station at Lorimer St. 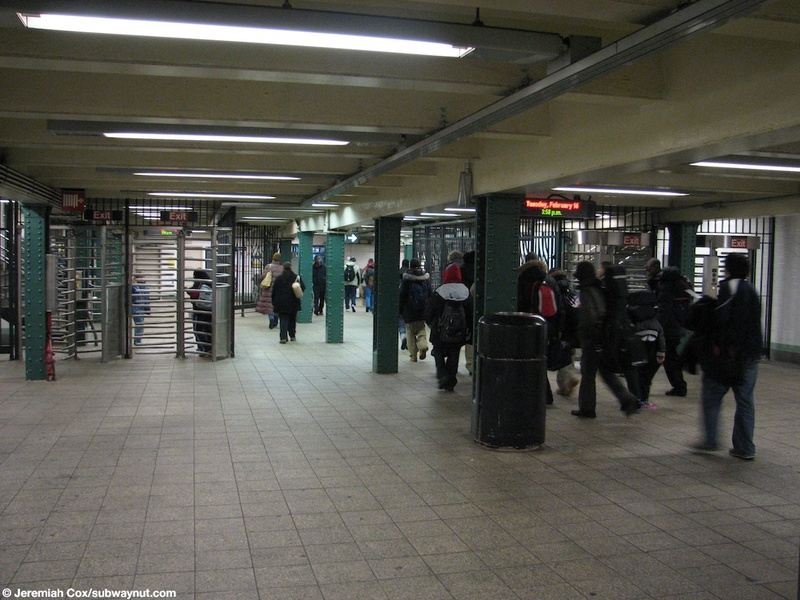 The ramp up to the Canarsie-bound platform is visible as well as the staircase down to the underpass-type passageway to the Manhattan-bound platform. 17 August, 2008 (metropolitang4) Looking down the portion of the Mezzanine that is still open at Metropolitan Avenue, the Police Station is viewable off in the distance. (metropolitang5) Looking towards the only exits form the Mezzanine to Metropolitan Av. 17 August, 2008 (metropolitang7) A name tablet at Metropolitan Avenue-Grand Street with tiling for 'To Street & Transfer' underneath it. 17 August, 2008 (metropolitang8) Looking down the Queens-bound platform towards the end when it gets quite narrow. 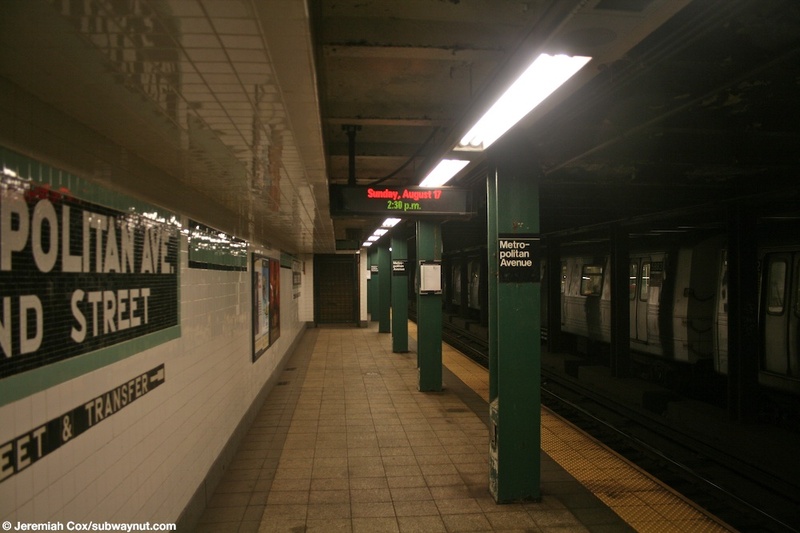 The train stopped on the Brooklyn-bound platform is 8 cars long because G trains, due to track work, are replacing the F in Brooklyn down to Coney Island. 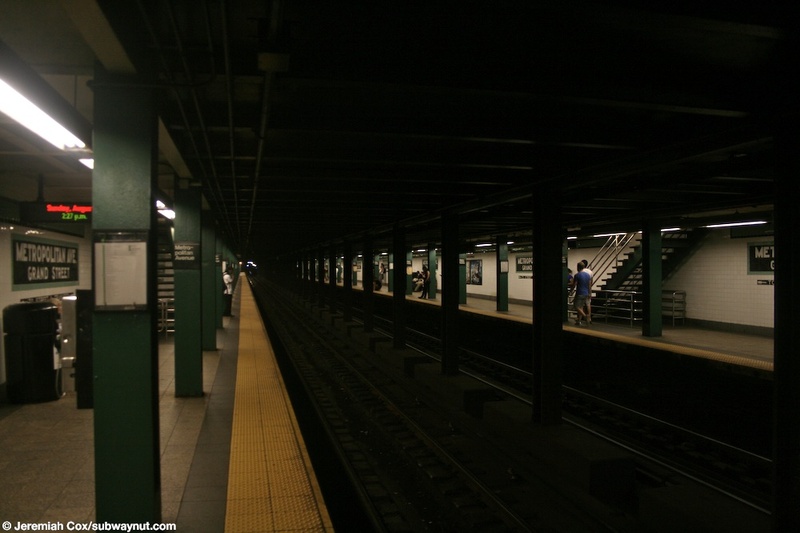 (metropolitang9) Looking across to the narrow portion of the platform on the Brooklyn-bound side at Metropolitan Av. 17 August, 2008 (metropolitang10) A name tablet on the other platform at Metropolitan Avenue-Grand Street.